Spruce up the look of your bathroom with this fine-crafted, efficient sink from Kraus. Thanks to its sturdy glass construction, this sink will maintain is stylish appearance through all kinds of everyday wear and tear. Complete your next home improvement project by installing this top-of-the-line sink in your bathroom. As stylish as it is durable, this sink by Kraus makes a terrific addition to any bathroom. Made from glass, this sink is both wear resistant and stylish. Next time you take on a home renovation project, make sure to choose this top-notch sink. The Rosa copper kitchen sink is an innovative single bowl drop-in kitchen sink by Sinkology. The Rosa is perfectly design to install easy and look beautifully in any kitchen environment. This handmade copper sink features a reinforced faucet deck and easy to use installation clips and hardware. Every Sinkology copper kitchen sink is hand hammered for a unique and versatile look that fit into a wide range of kitchen designs. Make an immediate impact with a drop-in kitchen sink from Sinkology. Maintenance is also easy with copper sinks, simply wash with soap and water and occasionally wipe drip. Finish changes will occur its what makes copper unique and beautiful. This true work of art comes with a lifetime warranty. 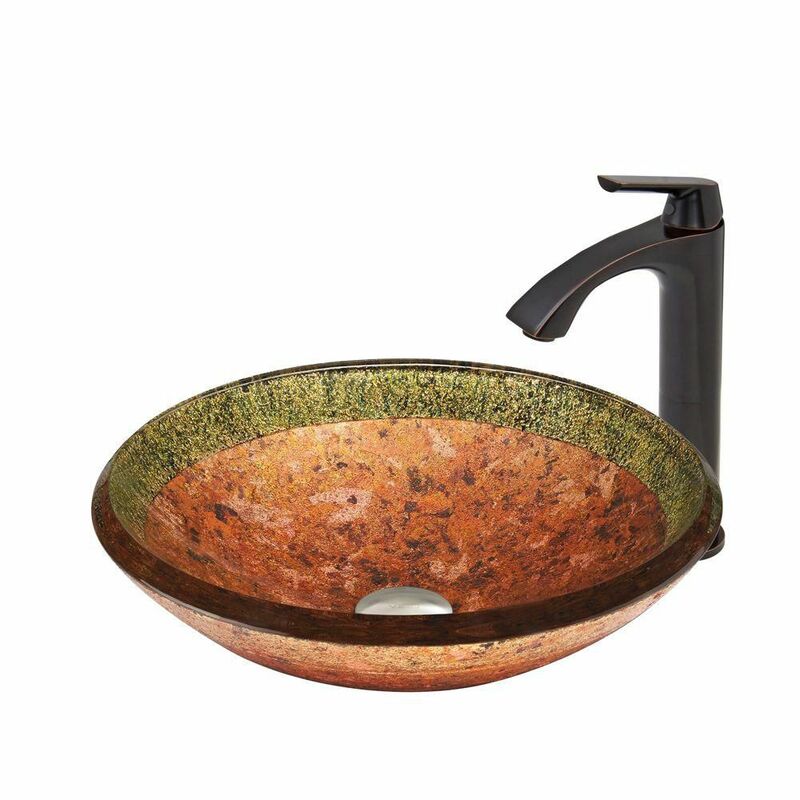 Glass Vessel Sink in Janus with Linus Faucet in Antique Rubbed Bronze is rated 5.0 out of 5 by 2. Rated 5 out of 5 by Robin from Even more beautiful than the picture!!... Even more beautiful than the picture!! Rated 5 out of 5 by Deborah from This sink is breathtaking This vessel sink is the highlight of an otherwise relatively small bathroom. I chose to off center the faucet, which shows it off the better advantage. The sink is very well made, solid and easy to clean. It installed in minutes, requiring only two small holes in the new counter tops.it changed the whole look and feel of the bathroom. No regrets about this one!